2012.9.26 Being Cute is not Enough! For Adult-mode Elementary Schoolgirls. The Wild Berry Now on Sale. A Sparkling Bicycle Loved by Adults. 2011.4.25 The Jitensha Joshikai (Girls' Bicycle Club) at the Bike Forum Aoyama has been completed for the community of girls who enjoy cycling. 2010.3.2 The HELMZ, a new genre of street bicycle jointly developed by Bridgestone Cycle and nari/furi, is Now on sale. 2009.12.2 The HELMZ is a new genre of street bicycle jointly developed by Bridgestone Cycle and nari/furi, and exhibited as the leading model at Cycle Mode 2009 Tokyo. 2008.11.27 Belt-Drive Bicycle Fitted with White Flash Double-Power Lights and One-Touch Double Lock Latest Albelt Fitted with All Mechanical Features Now on Sale. Anchor Pro Now on Sale. Smart Kids now on sale. Newly fitted with the S.P.E.C.8 Assisted Drive that controls the power of assistance in every gear position. 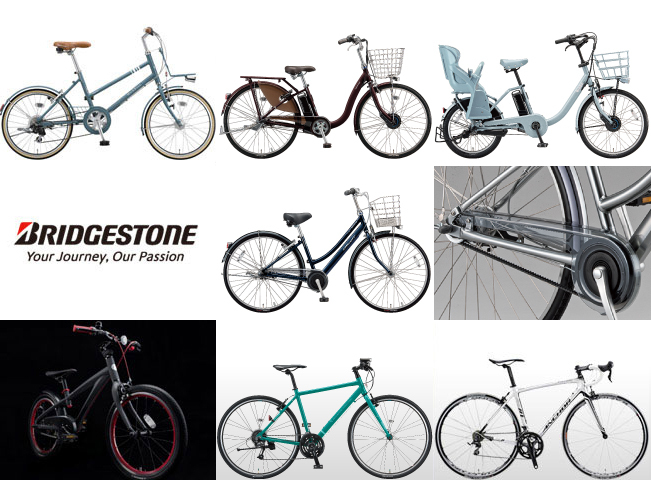 Copyright (c) BRIDGESTONE CYCLE CO.,LTD.